Hieroglyphics - Unlike Cuneiform, hieroglyphs did not evolve into symbols, but remained pictographic for centuries. 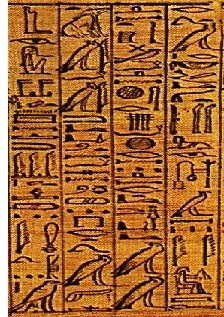 It is believed to have spread to Egypt from Mesopotamia and developed into its own unique writing system. There certainly was some evolution in hieroglyphic writing as pictures and symbols were both used together. Interestingly, a second form of script writing similar to Cuneiform, called hieratic, was developed in Egypt and used among the royal and religious classes and their scribes. It was roughly equivalent to writing in cursive in order to save time by not having to draw time consuming pictures. But it was still tied to hieroglyphics in that each hieratic symbol had an equivalent hieroglyph. Eventually hieroglyphs were abandoned altogether and around the 7th century BC, hieratic evolved into a hybrid script called Demotic, which retained most of the hieratic symbols but began adopting the more advanced alphabetic system. The final stage came around 300 AD when Demotic script became a true alphabet called Coptic. Coptic was used in Egypt all the way up to the 17th century.